Preventing kidney transplant rejection along with other medicine. It may also be used to treat signs and symptoms of active rheumatoid arthritis. It may also be used for other conditions as determined by your doctor. Imuran is an antimetabolite. It works by decreasing the effects of certain cells in the body's immune system. Preventing kidney transplant rejection along with other medicine. It may also be used to treat signs and symptoms of active rheumatoid arthritis. It may also be used for other conditions as determined by your doctor. Azathioprine is used with other medications to prevent rejection of a kidney transplant. It works by weakening your body's defense system (immune system) to help your body accept the new kidney as if it were your own. This medication belongs to a class of drugs known as immunosuppressants. 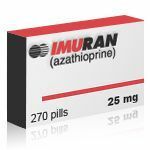 Azathioprine is also used to treat patients with severe rheumatoid arthritis who have not responded to other medications (e.g., nonsteroidal anti-inflammatory drugs/NSAIDs such as ibuprofen). Rheumatoid arthritis is thought to be caused by the immune system attacking the joints. Early treatment of rheumatoid arthritis with more aggressive therapy such as azathioprine helps to reduce further joint damage and to preserve joint function. 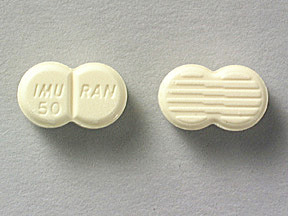 Imuran is a chemotherapy drug, now rarely used for chemotherapy but more for immunosuppression in organ transplantation and autoimmune disease such as rheumatoid arthritis or inflammatory bowel disease or Crohn's disease. It is a pro-drug, converted in the body to the active metabolite 6-mercaptopurine. 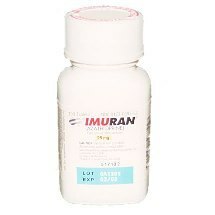 Imuran acts to inhibit purine synthesis necessary for the proliferation of cells, especially leukocytes and lymphocytes. 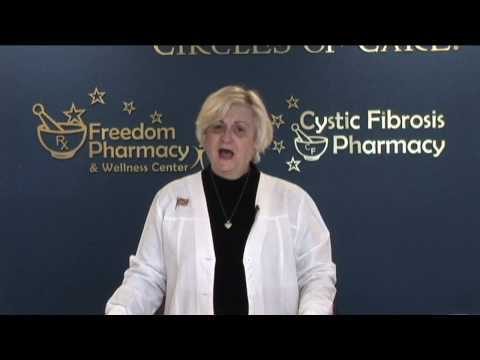 It is a safe and effective drug used alone in certain autoimmune diseases, or in combination with other immunosuppressants in organ transplantation. Its most severe side effect is bone marrow suppression, and it should not be given in conjunction with purine analogues such as allopurinol. The enzyme thiopurine S-methyltransferase (TPMT) deactivates 6-mercaptopurine. Genetic polymorphisms of TPMT can lead to excessive drug toxicity, thus assay of serum TPMT may be useful to prevent this complication.